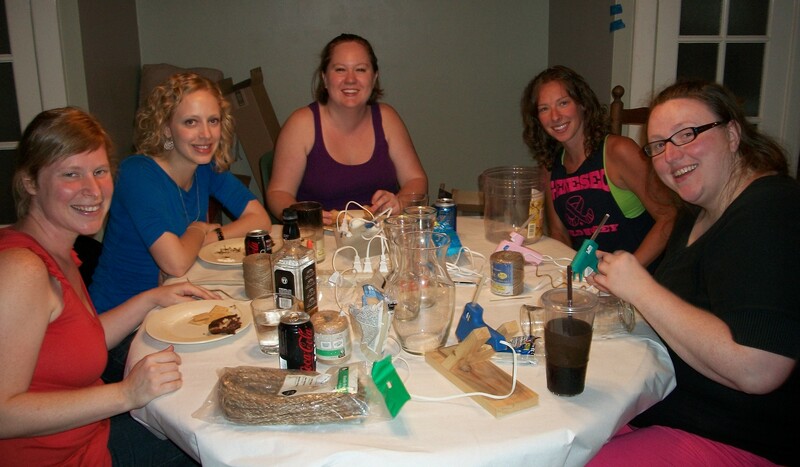 A bunch of fellow Pinterest addicts and I decided to have a Pinterest party. After an intense process that involved quite the mass of Facebook posts and email chains, we decided to make twine covered containers for our first project. 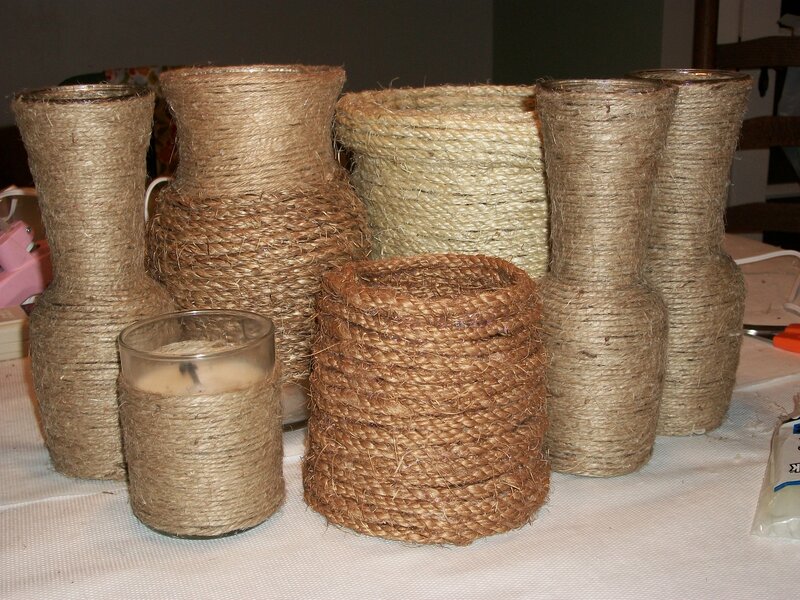 We all showed up with our containers and some twine. We had containers from the dollar store, old empty bulk pretzel containers, the cheapo vases that come with florist flowers, glass candles, and a Jack Daniels bottle. And, one of us decided to freestyle and use only the twine with no base container at all. The gathering was eclectic. I showed up looking quite excited (maybe too much of that Coke Zero there). Notice my hot glue gun complete with stand. 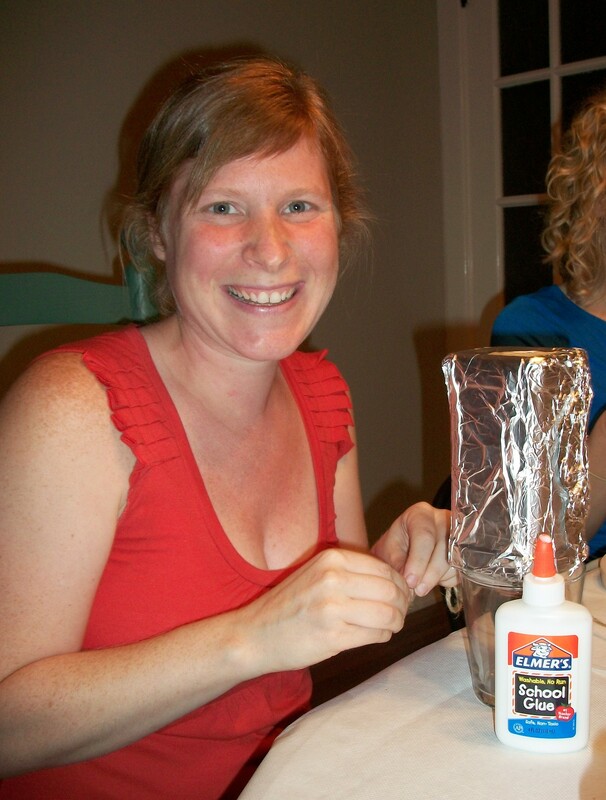 Meanwhile, my friend Becca, an art teacher by trade, showed up with Elmer’s glue. We ribbed her all night for being an art teacher who doesn’t own a glue gun. We had a few near Pinterest fails. 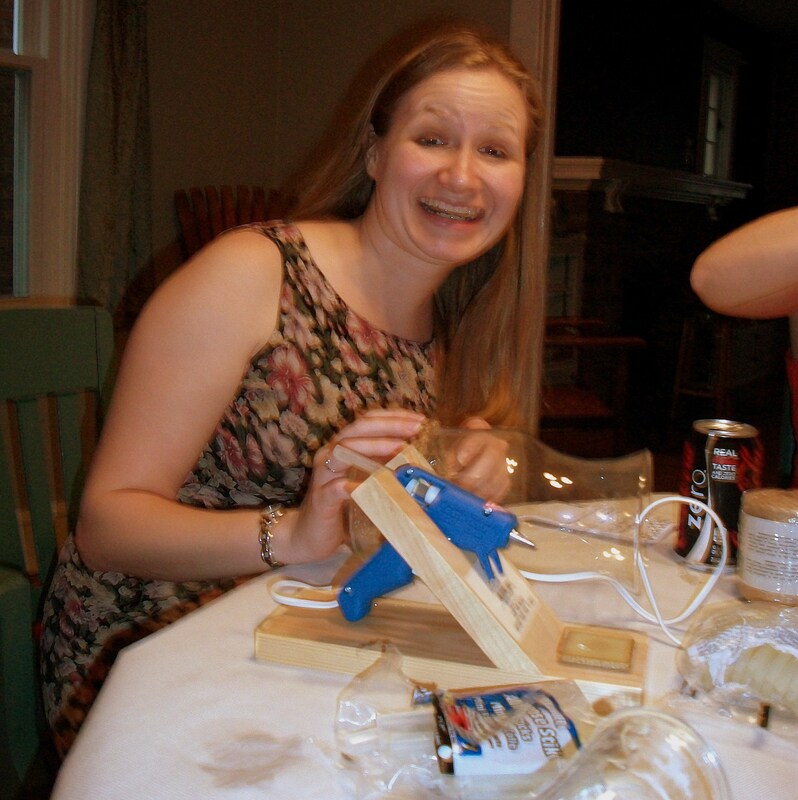 Poor Amy had some issues with excess glue as she tried to get her project started. 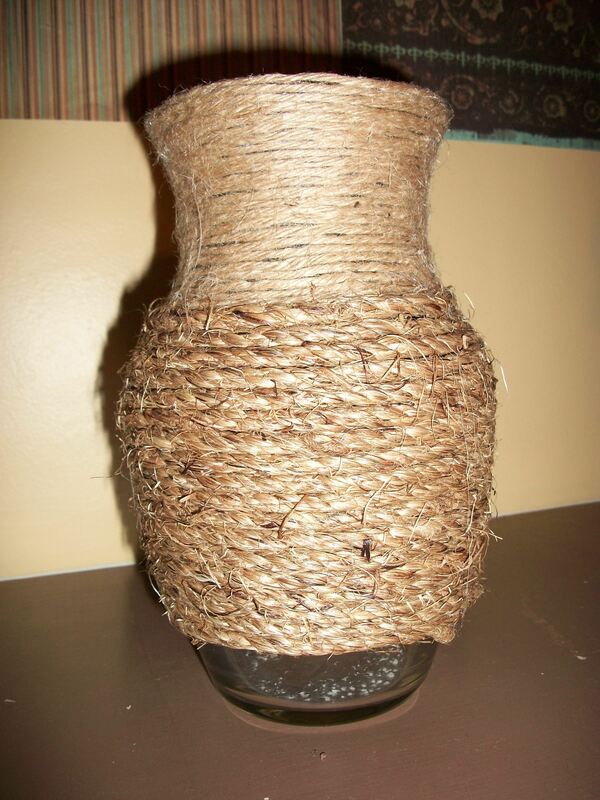 When she ripped the twine off the container, it looked like she had attacked a cat with a candle and some hot glue. She persevered though, used a lighter hand on the glue gun, and soon put all things to right. Nicole, who was attempting the freestyle method, ran into some difficulties as well. The tutorial that she was following was a bit negligent in describing where the glue should go, but she also got everything figured out. Here’s my finished product. 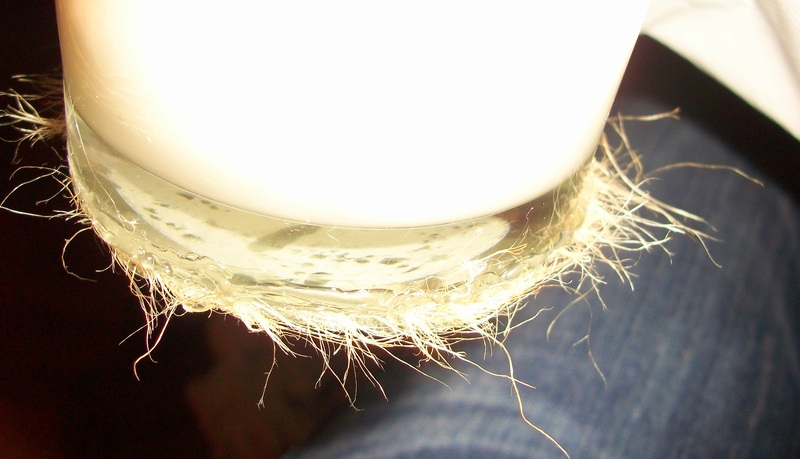 I left some glass visible at the bottom and switched the type of twine that I was using halfway through the project. We also ate some delicious food. I took Buckeye brownies, which are dangerous. With two layers of chocolate and one of peanut butter, I could be tempted to eat the entire pan at once and then lie on the floor writhing in blissful chocolate overload agony. One of my other favorite snacks of the night was an apple dip that was so simple. Blend equal parts of peanut butter and vanilla yogurt. That’s it. Two ingredients. I have a feeling that dip is going to wind up being my snack at school on a regular basis. After good food and lots of laughs…here are the completed projects. This entry was posted in decorating, Pinterest. Bookmark the permalink.